Mango nicknamed the “king of fruits” due to its immense nutritional value is a sweet fruit loved by many. It is not available all year round but the leaves of mango are. They are left to waste because many are unaware of the medicinal properties of the mango leaves. Mango leaves are medicinal and dense in powerful phytochemicals and nutrients. They have been used for centuries in treating a wide range of diseases. And they are many scientific reports to back the healing properties of these leaves. These leaves are also safe as they are no reported side effects but it should be taken in moderation and not combined with drugs to prevent drug-herb interaction. The leaves are very rich in vitamin A, B, and C; they are also rich in powerful antioxidants. There are many ways to take mango leaves as medicine; they can be taken in a tea form, decoction or in powdered form. Some cultures around the world like South East Asia cook and eat the tender leaves of a mango tree. Mango leaves are rich in hypotensive compounds which help in bringing down high blood pressure. They protect the blood vessels; strengthen them and prevent them from being blocked or narrowed. Mango leaves are also effective in treating varicose veins. Take mango tea daily to bring down high blood pressure and to also treat varicose veins. Mango leaves are effective in treating all kinds of respiratory problems including Cold, asthma, and bronchitis. It is even used to cure a cough and regain lost voice. You can take mango tea daily to treat respiratory problems or you can take the decoction. Mango tea is effective in bringing down high body temperature during a fever attack. When sick; take mango leave tea or decoction, but don’t take it together with the drugs. It should be taken one hour before or after your medicines and always ask your doctor before taking any herbal medicine if it is okay to take it when taking the particular drugs he gave you. These leaves are effective in relieving anxiety which can lead to restlessness; you can take mango tea or decoction daily to fight restlessness. You can also 3 cups of mango tea or decoction to your bath water; this will relieve you and help you rest better. Crush half onion into a thick paste. Get two large tender mango leaves and crush them too into a thick paste. Mix them together and brew the mixture in half glass of hot water. Take this drink regularly till you see the desired result. Add two tablespoons of this powder in a glass of water and let it stay overnight. In the morning, take this drink on an empty stomach and it should be done daily till you notice an improvement. You can also take mango tea or decoction daily. Get some mango leaves and fry them. You apply the ashes to the problematic tooth or teeth. Then you wash it off after sometimes. The leaves of mango are effective in treating gout and removing excess uric acid from the body; this is possible due to their rich content of phytochemicals and antioxidants. You can take mango tea or the decoction twice daily; morning and night to cure this condition and hasten healing. Mango leaves help the digestive system to function properly; regular intake of mango tea prevents digestive problems, stomach problems. Mango tea is usually taken by people who have stomach problems and digestive disorders and it is usually called “stomach tonic”. Take mango tea every morning on an empty stomach to help treat any stomach ailment and digestion problems. It is also used in curing dysentery; the dried leaves of mango are added to a cup of warm water and taken three times daily. 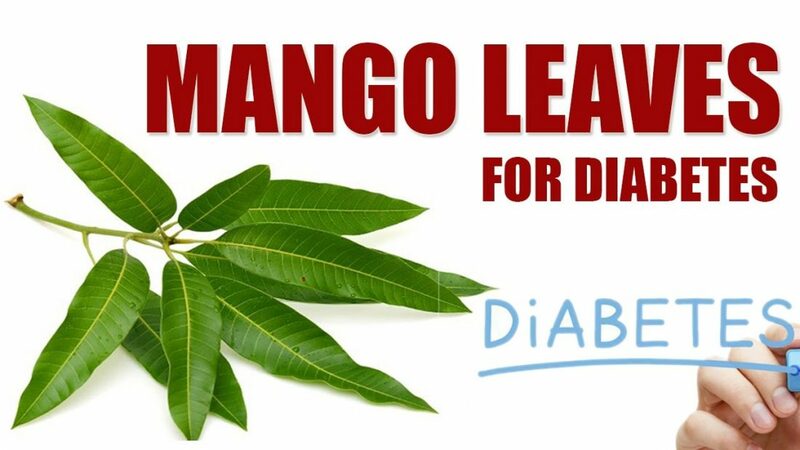 For centuries; traditional healers in various cultures have relied on the effectiveness of mango leaves in curing diabetes. The matured leaves are not used in this case but the tender leaves; tender mango leaves are rich in anthocyanidins, these are tannins that help in curing diabetes. It is also used in the treatment of diabetic angiopathy, hyperglycemia, and diabetic retinopathy. The leaves are rich in 3-beta-taraxerol and ethyl acetate. These compounds combine with insulin to activate GLUT4 and they also stimulate glycogen synthesis. To use mango leaves for medicinal purposes; you can make tea with the tender leaves. You can use warm water. Soak some fresh and tender mango leaves in a bowl of clean water and let it soak overnight. In the morning, strain the water and drink it throughout the day. For best results, take it on an empty stomach in the morning. Let it cool, and then you strain it. Add little honey and your drink is ready. You can also add lime or lemon juice if you please. Drying mango leaves is another way to use them as medicine. The leaves are dried in a shade then ground into fine powder. 2 tablespoons of the powder are added to a cup of hot water and allowed to steep for 5 minutes. Strain it and then your drink is ready. You can add honey or lemon or lime juice for taste and to make it more effective. I was diagnosed with Emphysema. My symptoms included shortness of breath, dizziness, lack of oxygen to all body parts, numbness of fingers, no energy, no appetite, fatigue, and bloodshot eyes. I was living at a place that has mold and mildew in the air conditioning unit. I also smoked a pack a day for 20 years. The Pulmonologist started me on Spiriva and Advair plus nose sprays, to reduce symptoms and slow down progression but I could not tolerate them for long due to severe side effects so I opted not to go on prescription medicines but decided on using herbs instead, October 18, 2017 after being on the herbs you recommended, i had a total recovery from Emphysema disease with this natural herbal formula treatment. The shortness of breath, dizziness has subsided. When I stumbled upon you guys, it was just pure instinct. And from that day on it has been one of the best decisions I’ve made in my life. The caring that goes into explaining what herbs work for whatever ails me is astounding. In today’s world where so many are after a quick buck, selling without care, Natural Herbal Garden’s staffs amplifies the difference. I’m a believer in karma, and for generations to come, this is a herbal store that will be leaving it’s footprint in this world.